An end of month rebound saw healthy gains for China’s core markets as well as other periphery. The last day of the quarter, coupled with a softening rhetoric surrounding US/China trade negotiations helped sentiment and cash flow. Core Shanghai bounced over 2.2% with the Hang Seng not far behind at 1.6%. Month and quarter end book balancing were also factors attributed to today performance. The Nikkei recovered early losses and was probably helped by the declining value in the Yen, probably not surprising given the Factory Output fell the first time in four months. Marching towards the 111 handle the currency has suffered recently with many Asian and LATAM counterparties. In India the SENSEX added some much needed ground while the currency played happily mid 68’s after yesterdays shock opening level. Europe followed on from Asia’s positivity with healthy gains from the opening. The strong open was soon followed by encouraging economic data where the inflation number edged a touch firmer to print 2%. Previous release was 1.9% so was mildly encouraging until the market talk is that the ECB could be increasing QE up to include the long end. It will be very interesting to see how this plays out with the FED raising and the ECB expanding along the curve. Even as Mario Draghi address 27 heads of state the message appears to have been directed towards a blame game rather than offering true direction and proportionate alternatives. As equity markets rallied so did peripheral spreads implying the big buyer was active again for quarter end revaluations. The recently badly beaten DAX was todays core performer closing 1.2% firmer. UK’s FTSE managed just +0.3% but then the GBP did add an additional +0.75% for non-domestic investors for month end. Late Friday the EU has also agreed a plan they hope to alleviate much of the migration issue. The creation of centres outside and administering harsher penalties they hope will sit well with the public whilst bending to accommodate the Italian vote. Still looking like the consolidation phase expected for the first half of 2018 was right on track. Within this period we have not only seen the bottoming of stocks but also the low in for the DXY. Even though prices drifted from the days highs as the day wore-on, we still managed to close the half year session on a strong note almost unchanged with a healthy currency gain. Next week could be interesting as we have NFP numbers but also a shortened holiday week. 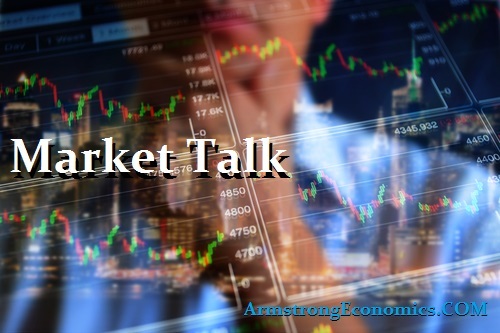 There is still a lot of cash on the side-lines or even made its way back into the bond market, so a sudden confirmation from economic data will show the green flag. Slightly disappointing to lose much of the days advances but always good to close positive. Japan 0.03%, US 2’s closed 2.52% (+1bp), 10’s 2.85% (+1bp), 30’s 2.84% (u/c), Bunds 0.30% (-2bp), France 0.67% (-3bp), Italy 2.67% (-10bp), Greece 3.90% (-9bp), Portugal 1.76% (-5bp), Spain 1.31% (-5bp), Turkey 16.12% (+32bp) and Gilts 1.28% (+2bp).